Perth has it all, modern and cosmopolitan with a big city vibe it still retains a friendly smiling atmosphere, outdoor lifestyle sits easily with urban chic, quality restaurants and eateries abound, golden beaches and the beautiful Swan River offer a wealth of opportunity for playing about in the water and the city's eclectic arts and entertainment scene spoil you for choice. Let us show you the sights of our beautiful city of Perth to get your bearings and benefit from the informative commentary. It's a true welcome to Perth. This 3.5 hour tour takes in most of the city's major attractions plus takes you to South Perth across the Swan River and along Perth beaches. Now you have a good orientation and knowledge of the Perth area, you can return to soak up some places at your own pace. Don't forget your DISCOVER AUSTRALIA Bonus Voucher Book for amazing discounts and bonuses. The bohemian port town of Fremantle has a unique feel and distinctive cafe lifestyle. See the amazing colonial architecture and experience Fremantle. En route to Fremantle take in the views from the "Tree Top Walk" in King's Park and travel along some of Perth's finest beaches. Travel back to the city alongside the Swan River. (Half day luxury coach tour). With the whole afternoon still ahead of you, there is still plenty of time to explore Perth city at your own pace. Take a walk to Perth’s newest waterfront destination – Elizabeth Quay, spoil yourself in the retail shopping precinct Forrest Chase or relax in your hotel – tomorrow you embark on an epic 10 day adventure on board the Vasco da Gama. Luxury Coach Tour with Hotel Pick Up, Overnight Perth Accommodation. 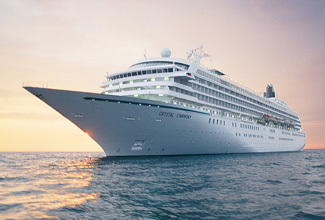 The Vasco da Gama offers a luxurious and unforgettable cruising adventure north through the Indian Ocean, along the Coral Coast to Geraldton, then onto to Broome before cruising through the Indonesian Archipelago, with ports of call in Bali (Benoa), Komodo Island and Semarang (Java). The turquoise and emerald waters of Australia’s stunning Indian Ocean surrounds are home to an incredible array of marine life, whales, dolphins, dugongs and turtles make these balmy waters their home, The Indian Ocean covers 73,427,000 sq km or one-fifth of the world’s ocean area and its waters are the warmest of all the great oceans. Today, you will be personally met at your hotel by a DISCOVER AUSTRALIA representative and transferred to the Victoria Quay passenger terminal to board the Vasco da Gama for your 10 night cruise. Spend your relaxing days at sea making use of the stylish contemporary facilities on board the Vasco da Gama, enjoying this classical style of cruising incorporating plenty of activities and a wide range of impressive entertainment options. Take your pick of the on board activities before enjoying the romance of the tropical evenings; perhaps take pre-dinner drinks in one of the ships' bars, then a post-dinner stroll along the ships deck before relaxing at a late night cabaret show. Tick Broome off your bucket-list. Broome is a tropical oasis of striking contrasts in both colour and culture. Beautiful white beaches, bright turquoise water, rust-red cliffs, rich Aboriginal heritage and a melting pot of Asian flavours in its very own Chinatown make this a place you will never forget. Warm temperatures and palms deliver a tropical vibe that is blissfully chilled out. The locals call like to call it "Broometime", and all it takes is a stroll on the sands of world famous Cable Beach to set your own clock to its wonderfully relaxed pace. Broome’s rich and colourful history has created a multicultural melting pot that is reflected in the town’s welcoming and laid-back feel. Built on the pearling trade, these days Broome is a popular holiday hub and gateway to the wild Kimberley region. You won’t forget your port of call into Broome, whether you venture on-shore on an excursion or soak up the atmosphere from the deck of the Vasco da Gama, Broome is the ultimate tropical getaway. Today continue cruising North towards Bali. take in spectacular vistas of the Indian Ocean and make use of the variety of on board facilities aboard the Vasco da Gama. Explore, relax and enjoy tropical Bali. Bali is home to an incredible wealth of stunning natural beauty, verdant hills and mountains, spectacular coastline and sandy beaches, deep forests and gushing rivers, an island of contrasts, bustling, vibrant cities and remote untouched beaches, throw in a wealth of cultural, historical and religious attractions and you’ll see why this beautiful island is such a popular destination. Cruise through the spectacular tropical islands of the Indonesian archipelago, featuring dramatic volcanos, white sandy beaches and thick rainforests. Experience a port of call in Komodo island, part of the Lesser Sunda chain of Indonesian islands, and the rugged habitat of the 3m-long Komodo dragon monitor lizard. Spectacular Komodo with steep hillsides and crystal ocean waters is on succession of magnificent peninsulas. Our port of call in Semarang enables an optional tour to the famous Borobudur Buddhist Temple, dating from the 8th and 9th centuries. Semarang is a bustling mid-sized city with a population of 1.5 million on the north coast of Java. Its old quarters feature Dutch colonial architecture and including the landmark Lawang Sewu. Don’t forget your passport! Continue cruising South towards our next port of call Geraldton, while taking in the beautiful views of the Indian Ocean in all its splendour. Join the fitness team on the Sun Deck for a jog or walk or even a game of deck chess. You can even relax by the pool with a good book and a refreshing cocktail if you prefer something more laid back. With a choice of outdoor activities and indoor entertainment, you are spoilt for choice. Experience a port of call in Geraldton, located on the beautiful Batavia Coast. This seaside city is emerging as a trendy beach escape. Blessed with beautiful inner-city beaches and a warm, windy climate, it is up there with the top must-see surfing, kite surfing, windsurfing, diving, snorkelling, boating and fishing destinations in Australia. Besides a buzzing modern foreshore that offers shopping, dining and lively entertainment, Geraldton has established itself as a trendy seaside city with the emergence of cold-brew coffee, street-art and plenty of other great experiences. Take a moment to immerse yourself in the touching HMAS Sydney memorial. Today marks the end of your West Australian and Bali adventure. Cruise back to Fremantle this morning and when you arrive you will be personally met at the Victoria Quay Passenger Cruise Terminal by a DISCOVER AUSTRALIA representative and transferred to the airport to meet your flight home. For customers travelling from Perth, the package is 17 days in duration, travelling Adelaide to Perth on the Indian Pacific. Relax in your private cabin on board the Vasco da Gama while you sail the Indian Ocean and enjoy FREE full board cuisine with a selection of international cuisine, afternoon teas and late night snacks and self-service tea and coffee. Experience FREE on board big show entertainment, cabarets, and classical interludes. Choose from a range of FREE daytime activities, leisure facilities and on board guest lecture programmes (selected sailings). Enjoy on board leisure facilities such as an Indoor and Outdoor pool, a sauna, steam room, a fully equipped hair salon and a Duty Free arcade with boutiques, jewellers and perfumeries. Enjoy meals from a variety of styles of restaurants. Enjoy flexible dining at the Waterfront Restaurant, Waterfront Mediterranean and Waterfront Eurasia restaurants. Your package includes an inner cabin but can be upgraded to a range of cabins. Upgrade to Royal Penthouse Suite: Located forward on Navigator’s Deck 10, the highest accommodation deck, this expansive Royal Penthouse suite comprises of a sitting area with a double sofa-bed and a large private balcony. King bedded, this suite offers en-suite facilities with whirlpool bath and shower above, generous hanging and storage space and a fridge. See Upgrade Options below for details. Enjoy a range of optional shore excursions on your cruise aboard the Vasco da Gama that are designed to illustrate the highlights of each port of call and maximise your time ashore. All shore excursions are competitively priced and operated by qualified and reputable ground handlers. Enjoy the peace of mind knowing that you will return to the ship before it sails. Shore excursion programmes are released approximately 8 weeks prior to sailing and excursions can be pre-booked to ensure you do not miss out on your preferred excursion. You will be personally met by a DISCOVER AUSTRALIA representative and transferred from Sydney airport to the Indian Pacific railway station to begin your journey to Perth. On arrival in Perth you will be transferred to your Perth hotel. You will be met at your hotel by a DISCOVER AUSTRALIA representative and transferred from your hotel to the Vasco da Gama and from the Vasco da Gama to the Perth airport for your flight home. Broken Hill: Choose from a selection of included tour options. Kalgoorlie (Perth to Adelaide): Experience a thrilling tour of the world’s largest single open cut mining operation. Adelaide (Perth to Sydney): Choose from a range of included tour options. 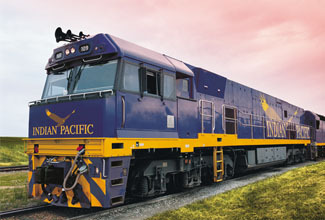 The Indian Pacific to Perth with Bali & Broome Vasco da Gama Cruise is very popular. Many dates book out well in advance, please book soon.